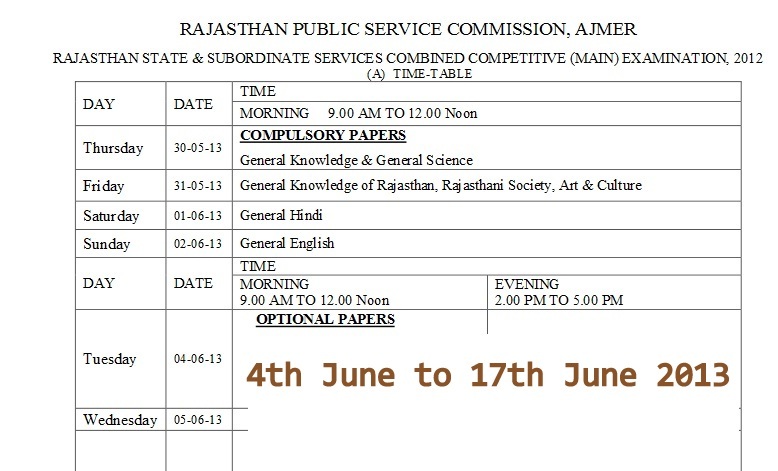 Rajasthan Public Service Commission (RPSC), Ajmer has announced the new Revised Time Table / Dates/ Schedule for for RAS Mains Examination 2012. RAS Main 2012 will starts from 30th May 2013. General Knowledge & General Science on 30th May 2013, General Knowledge of Rajasthan, Rajasthani Society, Art & Culture on 31st May 2013, General Hindi on 1st June 2013 and General English on 2nd June 2013. Optional Papers exams for RAS Mains 2012 will starts from 4th June 2013 while RAS Mains exam will ends on 17th June 2013. 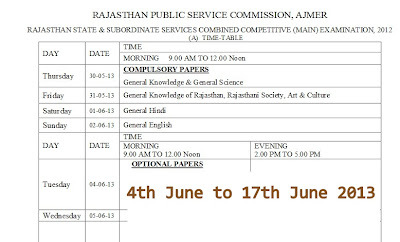 Rajasthan State and Subordinate Services Combine Competitive (MAIN) Examination 2012 will starts from 30th May per Official Press release by RPSC Ajmer on its website www.rpsc.rajasthan.gov.in on 20th March 2013. RAS Exam Mains Time Table / Date sheet of revised date is available on below website link. Rajasthan State and Subordinate Services Combine Competitive (MAIN) Examination 2012 Time table is available at below website Link. Check here for RAS MAIN 2012 Revised Time Table. For More Updates on RAS Pre 2012 News Follow us on FACEBOOK or GOOGLE+. now when can we expect pre 2013 notification and exam?? i am also waiting for this.